The Prime Minister visited a hijab (or veil) to visit the survivors or relatives of the deadly victims of the shooting. Its popularity already has a name: “jacindamania”. And it is that they have not gone unnoticed the integrity, compassion and, at the same time, political vision with which Jacinda Arden responded to the shooting in two mosques in Christchurch last Friday. 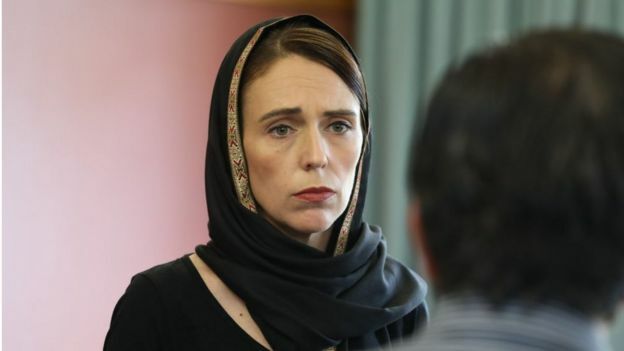 The Prime Minister of New Zealand sent an empathetic message of inclusion and even wore a hijab in the meeting with some of the survivors of the massacre that left 50 dead and more than 40 injured. Her performance in the face of the massacre was described by the British newspaper The Guardian as a “show of true leadership”, while others like The Washington Post celebrated the world’s praise for the leader. But who is this woman who has been qualified by her leftist policies as the “anti-Trump” of New Zealand? The brilliant political career of Jacinda Ardern, 38, led her to become the youngest ruler in the history of New Zealand and, incidentally, the youngest woman to run a country. 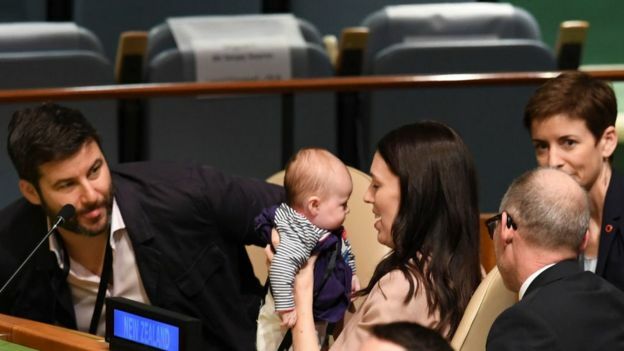 Image caption Ardern was the first high figure of a government to take her baby to a United Nations assembly. Already in office, she made headlines globally by becoming the second woman to lead a government in giving birth to Benazir Bhutto in Pakistan. Yes, she was the first to take maternity leave. And, as far as he remembers, it was unprecedented when he showed up with his baby on his back to a meeting of the United Nations General Assembly last year. Born in 1980 of the marriage of a police officer and a school lunch delivery, Ardern launched himself into left-wing activism from a very young age and joined the Labor Party when he was only 17 years old. “My main reason for getting into politics was because he felt called to care for others,” he said in an interview with the BBC. 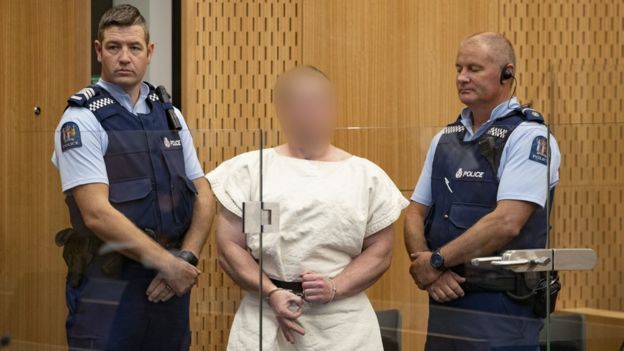 Image caption The suspect in the New Zealand massacre made a gesture with his hands that many link to white nationalists. After graduating from university in communication and public relations, she joined the government of then Prime Minister Helen Clark as a researcher and later moved to the United Kingdom where she worked as a policy adviser to Prime Minister Tony Blair. In 2008, Ardern was elected head of the International Union of Socialist Youth and, that same year, she won a seat as the youngest member of New Zealand’s parliament. For almost a decade she held that position, until a succession of resignations within her party took her in less than two months to become the deputy leader of the party and hence, the prime minister. Their policies have been described as “progressive left” and have been marked by measures to prevent climate change, promote women’s equality and a tendency to show closeness and empathy with their constituents based on what they define as “compassion”. “It takes a lot of courage and strength to be empathetic and I am very proud to be an empathic policy guided by compassion, that will attract critics, but I can only be honest with myself and with the type of leadership I believe in,” she said in another interview. with the BBC. In 2018, she became the first head of government in New Zealand to march in a gay pride parade and has spoken in favor of the legalization of abortion and marijuana. On the economic level, it has been singled out for taking protectionist measures, such as preventing foreigners from buying property in New Zealand, or promoting social equity policies, such as increasing the minimum wage and economic support for the most disadvantaged sectors. Image caption Ardern has based his political message on compassion, understood as closeness to the other. His measures were accompanied by growing popularity and was seen as part of a new wave of young leaders that included Frenchman Emmanuel Macron and Canadian Justin Trudeau. His motherhood during the government and the six-week absence that took place after giving birth (an unprecedented event) gave way to his fame was cemented. The glamorous magazine Vogue published her photos and a profile, Time included her in the list of the 100 “most influential people” and in less than two years she has gone through renowned shows and talk shows from Europe to the United States. And is that if the popularity of Ardern worldwide has won applause in the last two years, criticisms against him have also multiplied within New Zealand. Last October, when he celebrated his first year in power, his opponents questioned the “slow progress” the country had shown during the new government. They also questioned their management of the economy, after New Zealand’s business confidence indicators plummeted to their lowest level in a decade after Ardern restricted foreign ownership and raised minimum wages. His government has also faced massive strikes by elementary school teachers, nurses and bus drivers demanding wage increases, with no solution in sight. Image caption The shooting left 50 dead and 40 injured. And despite his position after the shooting in Christchurch, many have also questioned that since his campaign has advocated to reduce rates of immigration rates on the grounds that his country does not have the infrastructure to receive more people. 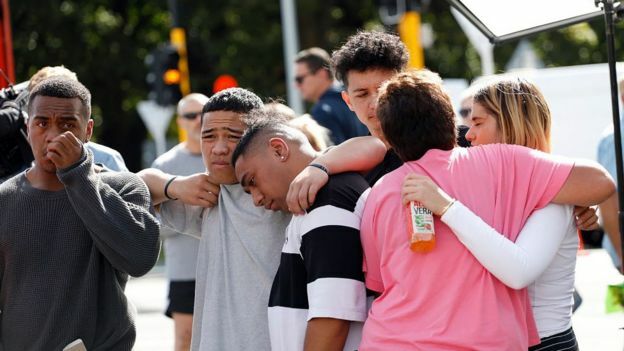 However, after the tragedy last Friday, the Prime Minister has received praise again all over the world for the way she found to tell the New Zealanders what her country – and her government – defend for what they bet. During his celebrated speech shortly after the shooting, Ardern considered that the attack had not occurred in his country because it was a new port for hatred, racism or extremism, but on the contrary. “We were chosen because we are not any of that, because we represent diversity, kindness, compassion, a home for those who share our values, shelter for those who need it, and those values ​​will not be and can not be shaken by this attack, “he said. “They are us,” he added.